The Firesteel River region, Located between Winona, in Houghton County, and Lake Mine in Ontonagon County, is the hands-down winner for scenery on the Copper Range. In the words of John St. John, who explored the Lake Superior region in the early to mid 1800s: I have seen sights, but never one before so unconfined by hill or plane, or close horizon, where the spirit seemed set free to range at will. A scene only to be felt. St. John was describing his view from the Albion mine in Keweenaw county. 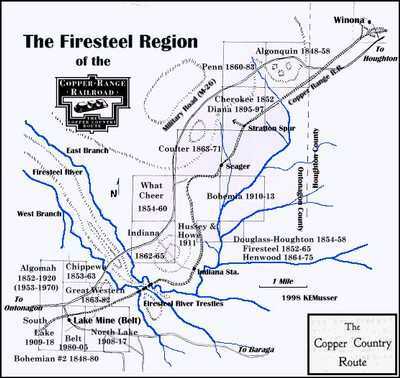 If you were to walk the Copper Range today from Winona south, youd find the first eight miles to be nothing but trees and rolling hills, slashed often by branches of the Firesteel River and its many tributaries. The forest is a virtual no-mans land between Houghton and Ontonagon counties. No people, no traffic, no man-made objects and no sound except for nature. Walking the old roadbed gives you a sense of what traveling in this area in the mid 1800s must have been like before the coming of the railroad. In St. Johns time only a foot path existed between what is now Houghton and the Douglass-Houghton Mine. In 1846, the year St. John was writing of his experiences in the Keweenaw, Douglass Houghton drowned in Lake Superior off Eagle River. In that same year the Douglass-Houghton mine became the first mine to operate in the Firesteel River area (not to be confused with the Douglass Houghton Mining Co. of Houghton County, or the Douglass Mine or the Houghton Mining Co. or the Houghton Copper Co.). Situated between present day Winona and Lake Mine, the Douglass-Houghton Mining Company owned 480 acres adn by 1852 had built four shafts and 10 dwellings on the property. At this time they purchased the Firesteel Mining Company located a half-mile to the south and continued their works into this property until 1864. A survey conducted in 1855 to plot a military road between Green Bay and the newly built Fort Wilkins at Copper Harbor revealed only a bridle path existed between Ontonagon and the Douglass-Houghton mine. To the north a 20 mile foot path was the only route to what would later become Painesdale. From there to Houghton was a trail described as a winter road . The Houghton mine, along with the neighboring Indiana and Bohemian Mining companies, found it difficult to make a profit within this primitivetransportation network.The Civil War would change all that. After sitting in Washington for eight years, a bill proposing the construction of a military road became more important with the onset of the war. President Lincoln signed the bill in 1863 just as Lee was moving into Pennsylvania. Construction of the road was performed by several groups all working different sections. It was still only a three- season road  for 50 years after its construction the road was never passable in Spring or during heavy rains. 1864 saw the beginning of the Winona mine to the north and a reorganized Bohemian Mining Company to the south. The Winona struggled for 20 years but transportation problems killed it in the 1880s. Born again with transportation provided by the Copper Range Railroad and money from the Copper Range Mining Co. in 1899, the Winona died again in 1920 after producing just under 9,000 tons of copper. The Bohemian had holdings in Greenland and at the Lake Mine location, becoming the first true member of what would later be referred to as the Lake Mine Group. The Bohemian was up and down more than a roller coaster and by 1871 they were down for good, never having been profitable. The area surrounding present day Lake Mine was very active, either with paper companies controlling land or active companies working in the field. The Bohemian along with the Great Western were acquired in 1880, and along with the Penn in the north became generally known as the Belt pool. The Penn was never worked by the Belt but further south work began in earnest. Settlement of this area began in the 1840s and in the center of the Great Western and Bohemian properties began the little town of Belt, which had a colorful English background. Funding for the project was promoted by Francis Ellerhausen, Esq., whose address was the Palace Chambers, City of Westminster, England. By 1883 Ellerhausen had collected $250,000 and work began not on a mine, but on a stamp mill. The milling complex was ready before work on the mine began in February 1884, breaking most of the conventional rules of mining for profit. Over the next six months investors got nervous as the price of copper dropped from 20 cents to 10 cents a pound. Working on borrowed money, the investors called it quits by August. This episode became known as the worst case of mine mismanagement on the Range. Machinery and supplies in like-new condition left behind by Belt were acquired by the Artic Mining Company as they continued to develop the site. This development paved the way for the Lake Copper Company in 1905 after the railroad arrived. While the Belt property was being further developed by the Artic, a well known civil engineer from Hancock, f W. W.Stockley, began platting a railroad line from the Chicago, Milwaukee and St. Paul tracks near Greenland Junction to the Winona Mine. This line would connect with the survey being conducted by Thomas Appleton from Houghton to this point and would become the Copper Range Railroad. Tracks were laid in September of 1899 from the CM&St.P junction to the Firesteel River in conjunction with tracks being laid from Houghton south to meet at this point. From Winona south the Copper Range follows a straight line directly into the low rugged mountains which make up the spine of the Keweenaw peninsula. Following a ridge at the 1,180-foot level, the railroad twists and turns to follow the route provided by the ridge, augmented by a multitude of deep cuts and fills. A major river system is not encountered until the Firesteel. The East Branch is the first crossed from the north, followed by two branches of the West Branch. Three trestles, 516-, 597- and 554-feet long, span four ridges, cut to depths of 85 feet by the river, over a distance of only 2,500 feet. All were constructed by the Phenix Bridge Company of Phenixville, Pa., and still stand today, almost 100 years later. They were originally built with wooden abutments but these were replaced with concrete around 1910. Following the completion of the line the Copper Range strategically located structures to support the route. The history and structures of Winona will be covered in a later chapter. The Stratton Spur, which consisted of a lone freight house and shelter was the subject of a previous article (Part VII, Summer 1997). 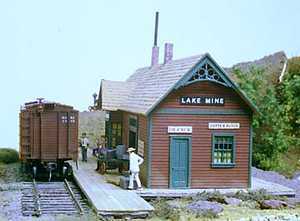 Seager was the location of the only Copper Range passing track between Winona and Lake Mine and boasted a standard Copper Range Section House and Privy (also, the subject of a future chapter). Mail was taken from Winona. Indiana had a passenger shelter, apparently similar to one at Twin Lakes which was 12x14 and three sided. Just enough to keep the snow off your back.The Indiana location also contained a spur track. There were also various lumber mills working in the area, some with spurs from the Copper Range. After the Copper Range Railroad came through the town of Belt, the Lake Copper Company bought out the Arctic and the entire Belt properties in 1905. Lake Copper also acquired the old Great Western, Shape and Aztec properties. The Aztec actually produced 700,000 pounds of refined copper in the late 1880s after the demise of Bohemian No. 2. The Aztec was famous for digging up a 100-ton mass of copper. The Aztec would later become the South Lake. With the addition of the North Lake and the Algomah, the entire district was under one controlling company. The Algomah was worked extensively for two years starting in 1852 when they sank five shafts but only produced 12,500 pounds and ended up in the red. The shafts were worked again in a very small way from 1905 until after the First World War. This area was also worked recently  from 1953-1970  but with no real production to speak of. The North and South Lake mines produced almost two million pounds of copper over the better part of 20 years. As a point of reference, the Champion mine, north of Winona, produced 438 million pounds in that same time frame. The North and South Lake were never great producers but they managed to limp into the First World War, spurred on by good copper prices, and stayed alive until the end of the war. The Lake group had a rare 49-inch gauge railroad (although not rare for the Keweenaw  here were a total of four) that served the mines and interchanged with the Copper Range.The Copper Range installed a 40-foot 100-ton Fairbanks scale in 1911 to measure and control the output from the Lake. The Copper Range built a 24x62 foot depot in Belt in 1900 to handle traffic from the surrounding mines. A standard section house and tool house were also at the town site. In 1905 the Copper Range built a gravity fed water tank, but output never met demand and in 1910 a 12x16 foot steam pump house was added to help the process. The signs on the depot that said Belt came down on March 15, 1910 when the post office officially changed its name to Lake Mine. By 1915 the town boasted a population of 150 and had telephone service. The depot supported an express and telegraph agent. By 1917 the town had peaked at 500 and both J. Craig and M. Barich operated general stores there. The Lake Copper Co. office was also located in the town. Following the First World War the price of copper dropped again and mining on the Lake properties stopped for good. Ten years later the population had dropped to 50 and J. Craig not only operated the only general store left, but was also the caretaker for the entire Lake Mine Copper Co. property. The post office operated until Aug. 31, 1939. The region today has completely returned to nature and except for the highway and the dirt path that used to be the Copper Range you would never know from a casual passing that anything had ever happened here. The Copper Range mainline is owned by the Michigan Department of Natural Resources (DNR) and is maintained as a snowmobile trail in winter and ORV trail in summer. The only structure that remains from south of Winona to Lake Mine is a hunting cabin at Seager and a few hunting cabins around Indiana. You can count the structures left at Lake Mine on one hand. Today, ghosts , not J. Craig, are caretakers of both mine and town. The crown jewels are the 100- year-old steel trestles over the Firesteel. Theyre too deep into the woods to salvage for a profit, otherwise they would be gone too. The bridges are currently owned by the state adn part of the snowmobile trail. Where once land was highly prized for its copper, today thr area is prized for its beauty and its lumber. About 45 percent of the area is owned by the State of Michigan and is part of the Copper Country State Forest. The remainder, except for 10 percent which is privately owned, is owned by The Mead Corp. of Escanaba, a major paper producer. In 1912 about 100 or so people lived in the town. Regular passenger service on the Copper Range ended in 1929, although as late as 1925 you could still take any one of five daily passenger trains that made stops at the depot. 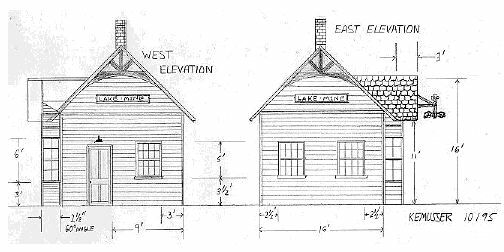 I decided to model this structure after finding photos of the Atlantic Mine depot, which was very similar, although the photos only showed two sides, east and north. I have still not been able to determine the rear plan, but that side of the model wont be visible anyway. The plans for the west end are completely fabricated by me. I used my best judgment, just duplicated the east end but replaced one window with a door. Maybe one day I will find a photo of the west end or the ICC plans. As I was not building an exact model I was able to use commercially available windows, doors and detail parts. My first rule of building windows is to buy Grandt Line if at all possible. The only major task in building this model is constructing the office windows. The office-window assembly was built from three Grandt Line windows (part number 300-5222 16-pane double windows). Two of these windows are cut to make up each 60-degree section. The center double pane is is used full-sized with the casements cut to match the angle of the side windows. Scribed Basswood siding was used below and above the windows and the entire section was trimmed with 1x2s and 2x4s. The window section was built and reinforced from the rear as a single assembly. The rest of the parts are as follows: The freight doors are Grandt Line 300-5198 with their doors cut in half and swung open to permit interior details from both sides. Two four- panel station doors (300-5088 ) were used and the double hung windows are 300-5032. 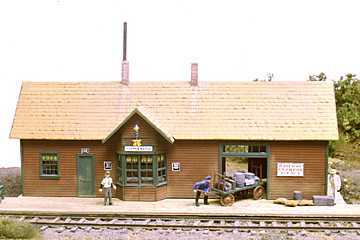 The model was built using basswood scribed siding and Campbell shingles. The chimneys were cast from plaster. The station board and the decorative roof brace are both Alexander Scale Models products, which in turn drove the pitch on the roof. The Alexander brace is similar to the one used by the Copper Range, but no where near exact. The color of the depot is a mystery. The Copper Range had a very strange sense of color. Some depots were light green others brown. I based mine on the color of a Copper Range tool house I came across at Mill Mine Junction. Although now just a pile of wood the color match is Floquil Boxcar Red for the siding and Weyerhauser Green for the trim. 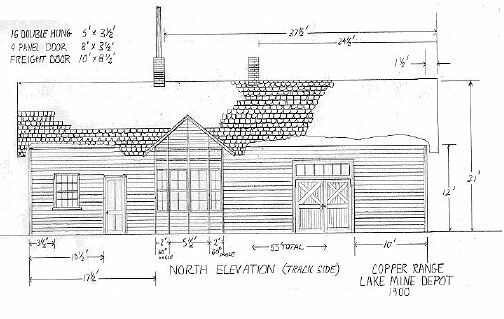 In part VII of this series I mentioned the dimensions for a Copper Range depot sign. The standard for all signs on the Copper Range is still available on a blueprint kept at Michigan Techs Archives. I have a photocopy of those prints from which I have reproduced the depot sign here. The sign is seven feet long and 14 inches wide to the outer edge of the trim. The letters are eight inches high and the board is 11 1/2 inches wide. Various fonts were used, this is just one example.